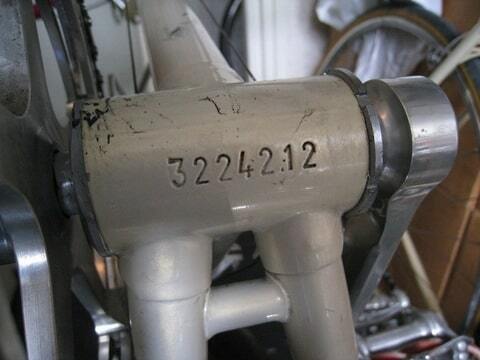 The frame number of your Champion Mondial can be found hiding underneath the bottom bracket. Before 1974 the Champion Mondials appear to have been numbered in conjunction with the 'ordinary' Gazelle bicycles, as this graph shows. In 1974 the Champion Mondial continues this sequence while the other bicycles adopt a new numbering scheme. The frame numbers before 1974 in the table below are approximations taken from a special edition of the magazine 'de oude fiets'. 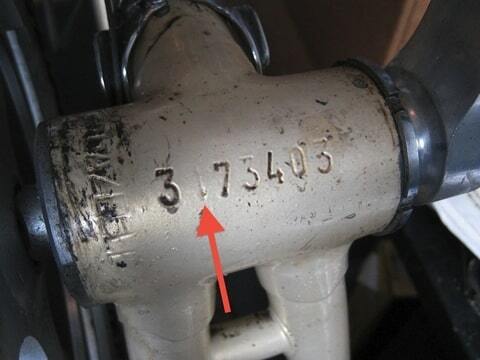 The frame numbers from 1974 onwards are the actual numbers from the files at the Gazelle factory. 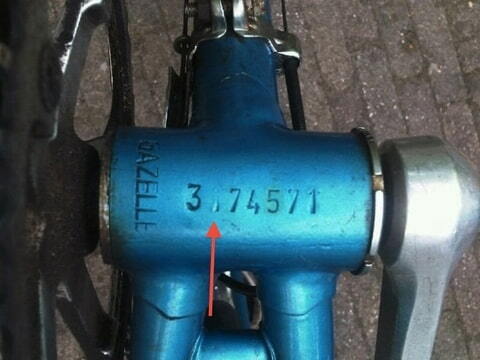 The frame number of a Gazelle Champion Mondial is on the underside the bottom bracket shell as seen on this frame dating from 1979. The frame in the first picture is exceptionally clearly marked. More often than not are one or more digits barely visible. Frames from the mid seventies are notorious for a next to invisible second digit '1'. The 1975er frames in the next two pictures demonstrate this fault. My decals and paintjob do not match the frame number! If your Champion Mondial has an earlier frame number than the decals and paintjob suggest then it was probably repainted at some time. It was very common practice back in the 1980s, early '90s to have your frame repainted at the Gazelle factory after a couple of years use. Sometimes the opportunity was seized to add some braze-ons that were not available at the time of original purchase such as cable stops or a front derailleur boss.